In Part 1 of this article, (courtesy The Philanthropy Roundtable), Dr. Gururaj “Desh” Deshpande discusses the setting up of the Deshpande Center for Technological Innovation at MIT, and its current research and development work. “My original plan had nothing to do with coming to the United States to become an entrepreneur,” says Gururaj Deshpande. When the young man from southwestern India first settled in the Americas, his plan was to pursue graduate studies in electrical engineering at the University of New Brunswick, not far from Canada’s Atlantic coast. From there, he went to pursue a doctorate at Queens University in Ontario. “Desh,” as everyone calls him, aspired to a career in teaching or research, perhaps at MIT, perhaps at Bell Labs. After he completed his doctorate, Deshpande made a critical decision. Peter Brackett, a professor-turned-entrepreneur from Queen’s, convinced him to try the corporate world. Brackett helped Deshpande land a job at Codex, a Motorola subsidiary in Ontario, where he worked on developing advanced modem technology. As he watched Codex benefit from his leadership and expertise, Deshpande came to believe that he could make it on his own. In 1984, he moved to the United States, where, four years later, he founded network equipment-maker Coral Network. In 1991, he launched a network switching firm: Cascade Communications. By 1997, over 70 percent of all Internet traffic was carried over Deshpande’s products. That year, Deshpande sold Cascade to Ascend Communications. The deal closed for $3.7 billion. The excitement of entrepreneurship drew Deshpande right back to work. A year after selling Cascade, he worked with a team of MIT researchers to launch Sycamore Networks. In 2000, he founded Tejas Networks, a Bangalore-based telecommunications equipment company. He is chairman of A123Systems, a manufacturer of high-power lithium-ion batteries; when A123Systems went public in October 2009, it raised $438 million and traded at a 50 percent premium on the day it was listed. The first fruit of their deliberations is the Deshpande Center for Technological Innovation at the Massachusetts Institute of Technology. Deshpande joined MIT’s board in 2000, and two years later made a $20 million gift to launch the center. His goal: to bring entrepreneurship to the laboratory. As he outlines the purpose of the Deshpande Center, you can hear both the engineering and entrepreneurial sides of his brain working. There is, he argues, a “disconnect” between university-led scientific breakthroughs and finding the right commercial application for those discoveries. Some of the products of scientific research are turned into new commercial technologies, but the success rate, in Deshpande’s view, is too low. Academics and innovators are brilliant people, but they are not necessarily entrepreneurs—and it takes an entrepreneur to see the best business opportunity for a new discovery. “Innovation,” says Deshpande, “currently has a bad supply chain.” The decline of industrial research laboratories at places like IBM and Bell Labs has “moved the basic center of gravity for research back to the universities.” But if academic research is to have real-world impact, Deshpande explains, the disconnect between academia and the market needs to be fixed. What’s at stake is nothing less than America’s future competitiveness. The Deshpande Center was one of the very first “proof of concept centers.” Faculty members who think they have an idea with commercial potential can apply for a start up “ignition” grant (usually about $50,000) to develop prototypes and determine market potential. About half the ideas that get ignition funding advance to the next stage, an “innovation” grant (up to $200,000) to iron out commercial risks and ready the technology for market. At the end of this second stage, the aim is for the technology to be ready to attract significant private investment. Hart originally thought he would try to apply his discoveries to the production of better security scanners, like the ones at airports or government buildings. But the entrepreneurs he was working with convinced him there were better commercial applications for his discovery. The market opportunity the team spotted was in dentistry. By tweaking the technology, Hart could make instant 3-D images of teeth, faster and with less intrusion than the traditional technique of taking a physical cast. They started Brontes Technologies, which, after two and a half years of growth, was sold to 3M in 2006 for $95 million. Hart is now working on another spin-out, Lantos Technologies, that is adapting his 3-D technology for use in imaging the ear canal for better-fitting hearing aids and audio headphones. Having already been through the process of starting a company, Hart probably could have proceeded on his own, but he went back to the Deshpande Center because of the advice and mentoring it provides. Lantos has received venture-capital backing and expects to receive final FDA approval to go on the market in mid-2012. Despite having two business successes under his belt, Hart says that what really gets him excited is “teaching two new classes this year. I am proud of being an entrepreneur but I am first and foremost a professor.” By letting Hart focus on the science and partnering him with ambitious business students to commercialize his ideas, the support of the Deshpande Center is giving him the best of both worlds. At the latest count the Deshpande Center has granted $11 million to back more than 90 ideas, which have resulted in 26 spin-outs. Apart from Brontes, others have included chemistry professor Donald Sadoway’s Liquid Metal Battery Corporation, which promises cheap storage of solar and wind power and won investment from Bill Gates’ venture fund; materials science professor Michael Cima’s Taris Biomedical, which has received $36 million in venture capital to develop a new drug-delivery mechanism for bladder conditions; and the Vertica Software database business founded by computer science professor Michael Stonebraker and acquired by Hewlett-Packard in 2011 for a sum reported to be about $200 million. There are also high hopes for technologies in the pipeline, including a new surgical “glue” and a continuous glucose sensor for diabetics. It is probably too early to know the full effect of the Deshpande Center. “We’re not growing lettuce,” adds Sandler. “We’re growing oak trees. It takes time to see results.” So far, the center has seen just over one in four grants turn into businesses, which Sandler thinks is about right. Its spin-outs have raised in excess of $350 million of investment and employ more than 400 people. If even just a portion of the spin-outs achieve their hoped-for success when they hit the market, the impact of the Deshpande Center will be much greater. When talking about results, Deshpande is keen to point out wider effects of the center on the culture of MIT. “Academics used to focus on the ideas that were the most scientifically prestigious, rather than most market-relevant,” he explains. “We are changing the way that universities operate, changing new graduate students’ approach to research.” Hart agrees, saying that before he connected with the Deshpande Center, “I hadn’t been sure if commercial opportunities were open to academics.” Today he reckons that more than 70 percent of post-doctoral research students are starting their career thinking that they are going to be part of the new generation of “faculty entrepreneurs.” Indeed, one of his own graduate students has just spun out a 3-D imaging company called Viztu. Though Viztu has not received any direct support from the Deshpande Center, Hart insists that many of the next generation of start-ups should be counted as part of the center’s wider impact on campus. Successful start-ups do provide the Deshpande Center with some revenue, but it gets only a small sliver of the modest royalties taken by MIT. It would take a Google-sized success to make the center self-financing. Some of the new businesses have also made gifts of stock, which may become an important source of financing in the future but, again, not immediately. 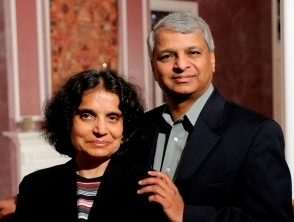 Of Deshpande’s original gift of $20 million, $8 million went into the center’s endowment and the balance has funded its programs. Other donors are now coming on board to provide the necessary future funding, including other MIT alumni working in technology. “I’m confident that the center will be sustainable,” says the founder. A shift from the philanthropic model to one that is more like a for-profit, in which successes provide funding for future ventures, could guarantee long-term sustainability. Interest in the model is spreading to other universities. Former executive director Krisztina Holly is now leading similar work at the Stevens Institute of Innovation at the University of Southern California. The state of Colorado has recently launched the Colorado Innovation Network, a partnership between the Governor, Colorado State University, and the University of Colorado. The model is also expanding overseas. Singapore has launched an Innovation Center (as part of the Singapore-MIT Alliance for Research and Technology) that is replicating the Deshpande Center practices. Universities in Portugal and Russia are looking to follow suit. Deshpande is supporting this dissemination process through the newly created Deshpande Innovation Network that is available to any university. Stay tuned for more updates regarding Dr. Deshpande’s work and career.